I took some time this week and finally did something with my new Dylusions Creative Journal that I've had for a couple months. That blank page is just so dang scary isn't it? Especially when said blank page is the first one in a new journal. 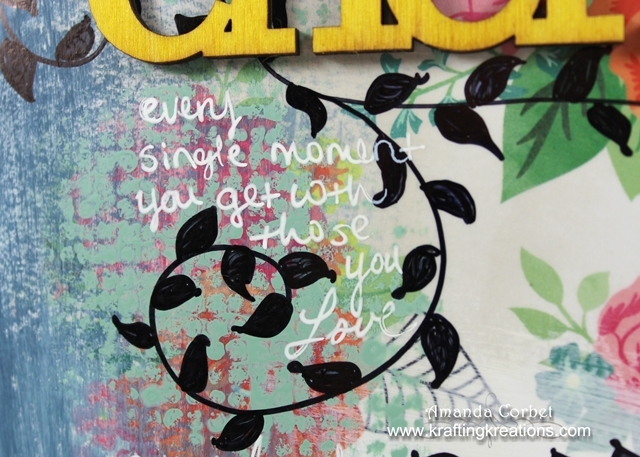 Even more so when it's your first actual mixed media journal... So I took my Shades of Spring Frosted Designs kit from February and used some of the goodies from the kit to make this lovely journal page. 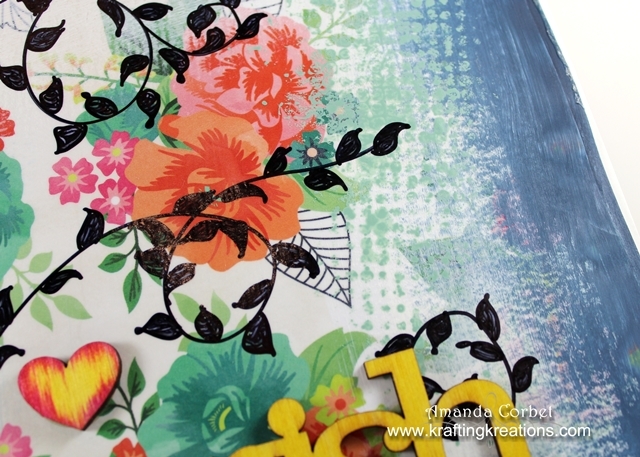 I cut the patterned paper down to fit my journal page and glued it on with some Decopage from DecoArt. Then I took some Titanium White paint and dry brushed it around all four sides. I added some Deep Midnight Blue dry brushing on the sides and allowed that to dry. Next I used the Distress Paint Dauber in Juniper with the Faded Dots stencil to add some splotches of dots here and there. Then I took a good ole Sharpie fine point marker and doodled on some vines with leaves. 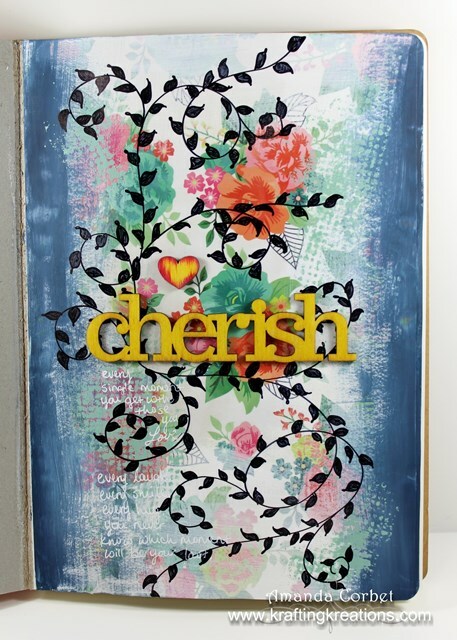 I took the wood "cherish" and heart and tapped the Squeezed Lemonade Distress ink pad directly onto the wood to add a bright pop of color. For the heart I touched just the edges into the Picked Raspberry Distress ink pad and since it is such a small cute heart I managed to make the tips of the fingers holding said heart a lovely shade of pink. As the heart dried the raspberry ink slowly bled into the lemonade to get the pretty heart you see above. 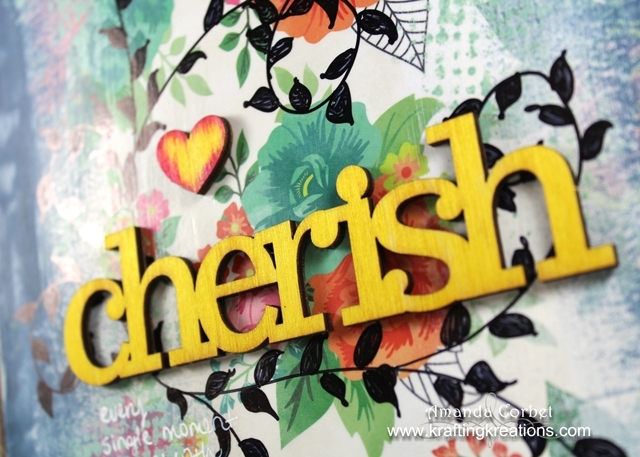 I used some Tombow Multipurpose Liquid Adhesive and a good heavy book to glue the wood pieces down onto the page. The book was just to hold the wood pieces pressed into the paper until the glue set. I cleaned up my craft room a bit while the glue set. Although my craft room could use a lot more than just five minutes of cleaning... but that is for another day. The journaling was done with a White Signo Gel Pen and under "cherish" it says "every single moment you get with those you love. every laugh, every smile, every hug. you never know which moment will be your last." 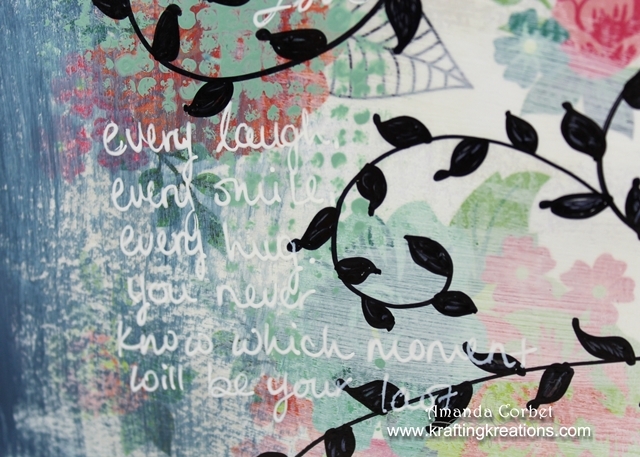 This page also works with the current Kit Challenge at Frosted Designs. The challenge was to use three of the following: White Gel Pen, at least one distress ink, at least one wood veneer, the color pink, or at least one sticker. Four out of five isn't bad at all huh? Either way I really love this page and it allowed me to express what I was feeling in that moment. Not to mention I got to play around with some paint! And get my fingers inky!